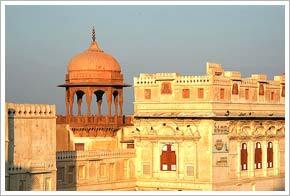 Junagarh Fort has mesmerized countless travelers by its beauty and richness. It was built by Raja Rai Singh in 1588. He was the sixth ruler of Bikaner who ruled from 1571 AD to 1612 AD. Its complex is truly fascinating as it houses 37 palaces and temples. Its beautiful palaces, temples, courtyards, balconies, pavilions and gardens have so much to offer to the visitors. Over the time, several rulers came and resided at the fort and at the same time added new palaces to its complex. Step into the interiors of these fabulous establishments where a royal treat awaits your eyes. The walls are festooned with meticulously carved stones, classy paintings and inlaid semi-precious stones. 'Invincible' would be an apt word for this fort as it was never conquered. Unfortunately it was captured once but only for a day. The fort is a perfect marriage between several architectural styles and the credit goes to Raja Rai Singh who was well traveled and welcomed the 'idea of combining different architectural styles of different places'. Built in red sandstone, Junagarh Fort is a perfect example of unity in diversity. Several architectural styles rest in harmony here. All the buildings in Junagarh Fort have their own charm. Some of the notable buildings are the Badal Mahal or Cloud Palace. The walls inside this palace are adorned with small painted clouds. It gives the feeling of a peaceful walk in the clouds. How exciting! The Anup Mahal boasts of the lacquered ( any of various clear or colored synthetic coatings made by dissolving nitrocellulose or other cellulose derivatives together with plasticizers and pigments in a mixture of volatile solvents and used to impart a high gloss to surfaces) walls decorated with colored glass in gold and red. Suraj Pol, Karan Pol, Lal Niwas, Durga Niwas Chandra Mahal (Moon Palace), Phool Mahal, The fort Museum entice the tourists with their uniqueness. The museum displays a rich array of jewelry, illuminated manuscripts, jars, exquisite carpets, weapons, treaties, military decorations and the 'Farmans'. Also pay a visit to the beautiful Har Mandir within the premises of the fort. It is dedicated to Lord Krishna.